Space, light and function. Each of the sixteen luxurious homes at Mimosa Terrace is designed to enrich the flow of your life. Spacious living and oversized windows spilling light – all converging to create a special sense of place. Enjoy that nook where you can grab a book and curl-up to relax, or throw open the doors to your oversized covered terrace, invite a few friends and whip-up something wonderful in your summer kitchen. Mimosa Terrace makes a subtle statement of sophistication as it blends into the graceful and historic neighborhood of River Oaks. Residents and guests are welcomed into the attractive two story lobby with a relaxing welcome that sets the tone for life at the upscale elegant homes. With your privacy and security at the forefront, the lobby includes a reception area with full time concierge service. Sophisticated floorplans, strategically designed with ease of flow and abundant natural lighting, provide upscale comfort for residents, pets, and their guests. In addition to all bedrooms having large windows, most bathrooms also have natural lighting. Frontage residences have pet-friendly garden porches and unobstructed floor-to-ceiling window wall views in the living room. All residences have spacious private covered terraces or “Gardens in the Sky” with outdoor grills and sitting area to supplement the luxury setting for hosting friends and family. Sophisticated Floorplans: Every residence has three bedrooms, most also have a study, and three or more bathrooms. Spacious living, dining room & kitchen with walk-in closet as well. Space is well planned for efficiency & function. Abundant Lighting: There are large windows in all bedrooms and most bathrooms have natural lights. In addition, the floor-to-ceiling window wall in living rooms of frontage residences brings in light with unobstructed views. This strategic layout for natural lighting in each and every residence raises the bar for condo design. Kitchen: It’s more than just a kitchen, it’s the place you gather with friends and family, or quietly contemplate your day over that first cup of java. A kitchen is personal and should be personally beautiful. Partnering with the highly revered Italian cabinet maker, Poliform, their beautiful cabinetry are customizable for each of the sixteen homes, and are topped with porcelain, quartz, or natural stone, and complements with Gaggenau appliances. As the heart of your home, the kitchen features an oversized island accented with designer lighting and a breakfast bar. Best of all, it all overlooks the living areas, making it fun to be in the kitchen. Bathrooms: Enjoy a spa experience each time you step into your bathroom. With Hans Grohe fixtures, Poliform cabinets, and porcelain, quartz, and natural stone finishes, you may think you’re at a posh resort, but it’s all yours. Your master bath features double vanities, a private water closet, a freestanding soaking tub and a glass-room shower. The only missing detail? The Turkish towels. But that’s why you live in River Oaks, just call Neimans, they deliver. Private Large Terraces: This signature architectural element adds an outdoor room to your living experience, the private large terrace sports a summer kitchen and equipped for a gas barbecue. In addition, a pet-friendly garden porch is also included in A & B residences. Mimosa Terrace is designed to enrich the flow of your life. Surrounded by history and classic beauty, the residences at Mimosa Terrace complement the stature of life at River Oaks. Adjacent to the vibrant Upper Kirby District, River Oaks was established in 1920 and hailed as one of the country’s earliest models for community planning. The neighborhood planners ensured that River Oak’s parks and esplanades were planted with oaks, shrubs, azaleas and other flowers creating what was advertised as a ‘distinguished experiment in fine living.’ Also part of the early neighborhood planning was the Donald Ross designed golf course at the River Oaks Country Club. A century later this vision for River Oaks continues to flourish as the community remains one of Houston’s most prestigious addresses. In close proximity to fine dining, shopping, downtown entertainment, as well as Midtown, The Galleria and West Avenue, River Oaks is the perfect live, work, play community. 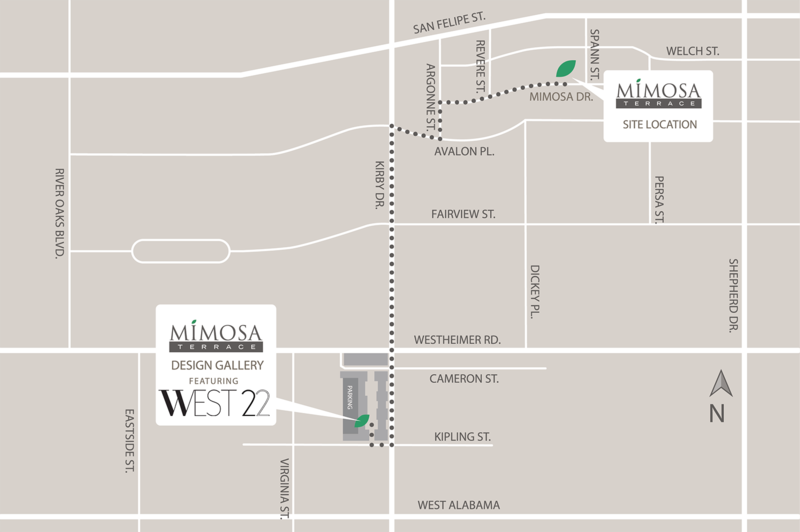 Inspired by the history and architecture of this distinctive neighborhood, Mimosa Terrace is a contemporary way for you to enjoy the sophistication of River Oaks. Mimosa Terrace is the culmination of the efforts of Citicape’s distinctive team of experts – Architects, Planners, Designers, Landscape Architect, Marketing specialist, Project Administrators, Construction Managers, & Realtors to introduce a new way of living to River Oaks: unbelievable elevated garden homes, perfectly located in and by the communities that offer the ultimate opportunity for you to experience your best life. Contributing to Houston’s residential and commercial landscape for generations, Citiscape, an award-winning company, is a family-owned and operated firm with projects within the USA and abroad. Citiscape’s projects distinguish themselves by their creative and quality. Initially founded with a focus on architecture for residential, commercial, and institutional including mixed-use projects and a master-planned community, Citiscape’s scope expanded into construction, land/property acquisition, and real estate development. Residential endeavors encompass multi-family development including inner loop patio homes as well as design-build for premium custom homes which span up to 25,000 sq. ft. Among its $100+ million of projects in the pipeline, Citiscape unveils its next masterpiece, an elite boutique condominium in Houston, with Mimosa Terrace at River Oaks. FOR FUTURE UPDATES ON OUR PROGRESS PLEASE REGISTER BELOW.